We have just considered that the Infinite ‘willfully and meaningfully’ consents to manifest as the Finite. Sri Aurobindo places a special emphasis on this phenomenon. (b)	willful because it has the power to ‘manifest’ what it ‘conceives’. WHERE IS THE ORIGIN OF THE IDEA THAT MANIFESTS THE FINITE FROM THE INFINITE? (b)	supremely powerful as it has to be effectuated in Reality. It cannot be an arbitrary idea without any relation to any real Truth of existence. (b)	OMNIPOTENT- as the Idea must carry the potency, the energy, the will to get effectuated in reality -- the Idea cannot remain stationary but must move out to act. Where can such an Idea originate? Can such an omniscient, omnipotent Idea originate in the Universal Mind? If the Universal Mind or the Cosmic thought-field is an amplification of the individual mind, then it is difficult to conceive how it can hold in its bosom the seed of the creative Idea that builds the worlds. In fact, the universal mind is a repertoire of infinite ideas -- ideas that are complementary to each other as well as ideas that are contradictory to each other. Each idea exists there in its own right without belittling other ideas and without getting belittled by other ideas. True, it is the reservoir of archetypal ideas but such archetypes are not necessarily correlated with each other. Invasions of ideas from the universal mind surface in individuals through universal rhythms of art, music, symbolisms as well as in fantasies, dreams and aspirations. They colour our myths, legends, and fairy-tales as well as influence our visions, rituals and behaviors. But in the end they represent a pot-pourie of chaos. 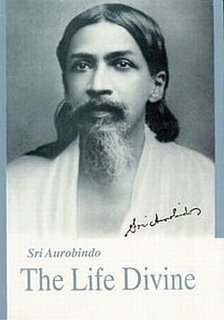 Sri Aurobindo conceptualizes that the manifestation of diverse ideas that constitute the universal mind have been triggered off by a supremely creative, omniscient and omnipotent Idea which must have originated at a higher plane of consciousness than the universal mind. Mind, as we know it, is a reflective mirror which receives presentations or images of a pre-existent Truth or Fact, either external to or at least vaster than itself. It represents to itself from moment to moment the phenomenon that is or has been. It possesses also the faculty of constructing in itself possible images other than those of the actual fact presented to it; that is to say, it represents to itself not only phenomenon that has been but also phenomenon that may be: it cannot, be it noted, represent to itself phenomenon that assuredly will be, except when it is an assured repetition of what is or has been. It has, finally, the faculty of forecasting new modifications which it seeks to construct out of the meeting of what has been and what may be, out of the fulfilled possibility and the unfulfilled, something that it sometimes succeeds in constructing more or less exactly, sometimes fails to realise, but usually finds cast into other forms than it forecasted and turned to other ends than it desired or intended. Is the world of finites an illusion? Its speech cannot utter nor its thought reveal. A channel for the little he tastes of bliss.